“Resurrexit Sic Ut Dixit!” (He has Risen as He said!) Easter is a wonderful time to reflect on a Gospel truth: Our Lord Jesus Christ did indeed rise from the dead for our salvation! Coming out of Holy Week, and reflecting on the horrors and humiliation Our Lord took upon Himself for our salvation on Good Friday, Easter Sunday is a welcome relief emotionally. 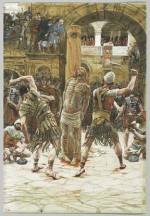 Jesus underwent scourging, the crowing with thorns, all the insults and calumnies, to say nothing of tremendous physical and emotional pain, all for us to have Eternal Life with Him! And as dark as it seemed on that Good Friday afternoon, Satan didn't triumph after all. Thanks to the Word made flesh, evil doesn't get the last word! This is a good time to remember that just as Easter is not just a Sunday, it’s a season. As such, when we’re done with the bonnets, the eggs and the special time with family, we have weeks to reflect on our Lord’s Victory over death and to be inspired to make it ours as well! As St. Paul says in 1 Corinthians Chapter 15, thanks to Christ's Resurrection, "death is swallowed up. Oh death where is thy victory, oh death where is thy sting? "(1 Cor 15:54-55). The main point of this important chapter is that, thanks to Christ's rising from the dead, we too can and will rise from the dead at the Final Judgment with glorified incorruptible bodies to join with our immortal souls in heaven! If we love Jesus and keep His commandments and die in a state of grace, we may rest assured of an Eternity of Love and Peace with God and the Saints there! The Gospel readings during Mass right after Holy Week reflect on the surprise and joy that the disciples must have felt seeing our Lord very much alive and in the flesh, walking with them, talking, eating and even making them breakfast! There was no way he could be mistaken for a ghost, as the startled disciples first thought when they saw him (Luke 24:37). He had flesh and bones and could even eat a piece of fish! Yet Jesus had told them several times during His earthly ministry, that after his execution He would rise from the dead (see for example Matt 16:23; Matt 17:9, and Luke 18:32-33). 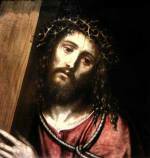 Still, the Apostle Thomas needed to put his hands into our Lord's wounds in his side to believe (John 20:24-28). Even today there are many doubting Thomases. Every now and then we read of some scholar on the Internet or on a cable news program excitedly telling us of some newly-discovered tomb where Jesus was buried, perhaps with his "wife"(!?) Mary Magdalene. About 20 years ago, there was a well-known author named John Dominic Crossen who speculated that the reason that there were no remains of our Lord was that he had been eaten by dogs! Even within our faith there are those who doubt the authenticity of this great miracle. 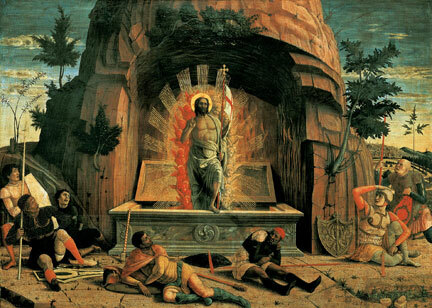 A subtle form of attack on the fact of Christ's Resurrection, one that has found favor even in some theology departments, sadly, is to say that this event was somehow symbolic. Still, as Jesus said to St. Thomas “Blessed are those who do not see yet believe”. 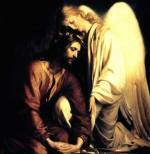 Besides St. Thomas' experience, Our Lord gave us, as St. Luke said, “many proofs” (Acts 1:3) that he was alive. After all, Christ didn't just show up once to one disciple, or perhaps just to His Blessed Mother, for maybe a few brief moments. Far from it! Note also that Sts. Peter (Acts 10:41), John (John 20:25), Luke (Acts 1:3, as mentioned earlier) and Paul (1 Cor 15:4-5) all refer to other appearances of our Lord before His Ascension into heaven over a 40 day period! 1) Refuting the Swoon Theory: it collapses on itself given the certainty of Jesus’ death before being taken down from the Cross. Kreeft points out that St. John the Evangelist saw blood and water coming from Jesus’ pierced heart, signifying his death from asphyxiation (John 19:34). 2) On the Conspiracy Theory: Remember that, particularly in those first few decades after Our Lord’s death and Resurrection, Christians were not exactly welcome with open arms! They faced persecution and even death from the Romans, for example, as when the Emperor Nero sought to make them the scapegoat for the great fire that engulfed Rome in 64 AD. However, none of them ever "broke" under torture with a confession that the Resurrection was a fabricated conspiracy tale. If it were, why become a Christian? To be persecuted for a fable? Thus, as Kreeft says quite well, they never let the cat out of the bag because there was no cat in the bag in the first place! He points out the apostles and disciples weren't slick or cunning types, but rather people who preached and lived a resurrected Christ! Kreeft also notes that it would have been logistically impossible for the disciples to have stolen Jesus' body from a well guarded, well-sealed tomb. In addition, if Jesus were indeed still there, the Jews who were vociferously opposed to any notion of our Lord being the Messiah, such as the high priests who clamored for His Crucifixion, could have easily produced His body. That never happened because there was no corpse to produce! 3) On the Hallucination Theory: As mentioned above in reference to St. Augustine, there were too many witnesses on too many separate occasions to Christ's presence among them, including 500 people at one time(!) (1 Cor 15:6) for Him to be a hallucination. And when do hallucinations eat food you give them (Luke 24:42) or cook breakfast for you (John 21:9)? 4) On the Myth Theory: The Gospel stories in general are not written like fairy tales. St. Peter put this so well in describing his witnessing, along with the Apostles James and John, Christ's Transfiguration (where our Lord turned dazzling white and spoke to Moses and Elijah). He writes "we did not follow cleverly devised myths" (2 Peter 1:16). Also it was not not just the four Evangelists, but their contemporaries who attested to Jesus' miracles, including, of course, His Resurrection. In conclusion, I would like to go back to some touching words from St. Paul in his letter to the Corinthians mentioned above, "If the dead do not rise, neither has Christ risen; and if Christ has not risen vain then is our preaching, vain too is your faith"
What does this mean? If Christ were just some wise teacher, that is to say, if we drain the supernatural out of His existence as the Son of God, then we lose hope in His promise of heaven! C.S. Lewis pointed out quite well in his book Mere Christianity that Jesus was never meant to be just some wise teacher or philosopher in the first place! All His claims to be the Son of God, (much less His predictions that He would one day rise from the dead) would have made Him a madman or a liar if this were the case! So, Christ's resurrection gives us great hope in our own someday as well. There is a glorious afterlife, in fact a Glorious Eternity awaiting us if we stay close to God! The answer to the song "Is That [This life] All There Is? ", is a resounding "No!" With the hope of the Resurrection and heaven, ask God for the strength and graces you need to carry your daily crosses, especially now, and for Him to help you with whatever "Spring Cleaning" you started during Lent! Happy Easter! Return from He Is Risen!